With the 7DAYS EuroCup Quarterfinals growing closer, several young players continue to contribute to their respective teams. Through 14 games, 21 players eligible for the 7DAYS Rising Star Award have logged over 100 minutes in the EuroCup this season. Of that group, 16 come from teams that made it to the Top 16. Of those 16 players, eight were born in 1997, four were born in 1998, two were born 2000, and two have yet to turn 18, having been born in 2001. 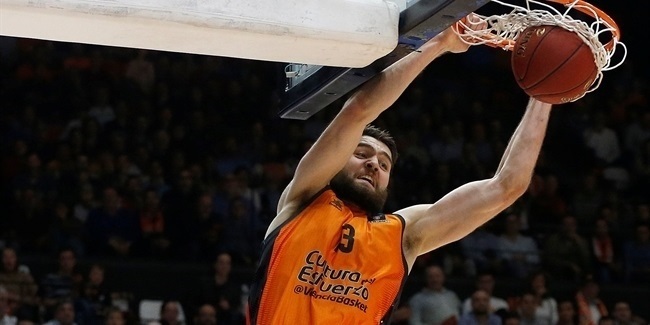 There is a long tradition of young players emerging from – and even filling major roles in – the EuroCup, with more than a few current stars like Ricky Rubio, Rudy Fernandez and Kristaps Porzingis getting their starts in the competition as teenagers. This season's group features plenty of prospects with significant long-term potential. The table above separates the EuroCup Top 16's Rising Star eligible players into two leaderboards. One is sorted by how big of a role they play offensively in terms of possessions per game. The other is sorted by how efficiently they have scored this season in points per possession as tracked by Synergy Sports Technology. For reference, recent Rising Star winners have averaged 11.2 possessions per game and 1.06 points per possession. 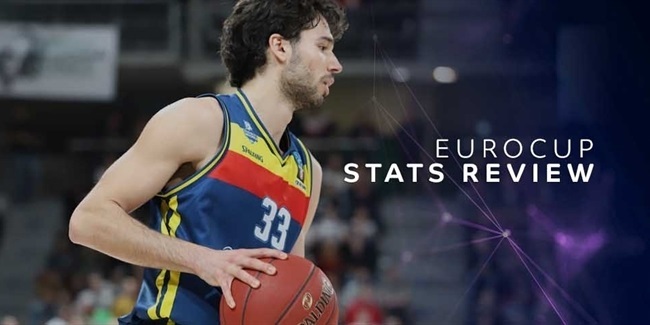 The first thing that stands out on the list above is that nine of the 16 players in this group have scored over 1.00 points per possession, above the 0.97 EuroCup average. Despite their relative youth, many of these players are not just getting minutes, but making positive contributions when they are on the floor. Vanja Marinkovic is the only Rising Star eligible player leading his team in usage, edging Marcus Paige as Partizan NIS Belgrade's highest-volume scorer. With games of 28 and 19 points under his belt, Marinkovic has shown the ability to put points on the board in bunches with his jump shot. Spot-up and off-screen opportunities make up almost half of his possessions in the half court, and he's shot an eFG% if just under 70% on unguarded catch-and-shoot attempts from the perimeter this season. LDLC ASVEL Villeurbanne power forward Amine Noua, deadly when given space on the perimeter, has also made significant contributions working off the ball inside, running the floor in transition, and even creating his own shot in the post. Noua's all-around skill level has made him a reliable contributor on offense. Of 110 players to use over 100 possessions in the EuroCup this season, Noua ranks 32nd in scoring efficiency. Averaging 13.3 points per game while shooting 61% from inside the arc and 46% from three-point range in the Top 16, the 21-year-old has been critical to his team's early qualification to the quarterfinals. Few players in the EuroCup have filled their role quite as effectively as Martynas Echodas has done for Rytas. 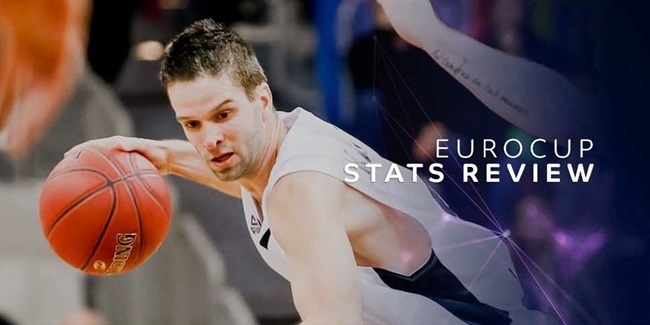 Of the 81 EuroCup players with 100 half-court possessions this season, Echodas ranks eighth in scoring efficiency, third in put-back scoring and sixth in roll-man scoring. Simply put, Echodas has been a force inside, using his size, mobility, and motor. Among the highlights of this list is the inclusion of two French teenagers, 18-year-old Sekou Doumbouya of CSP Limoges and Noua's teammate with ASVEL, 17-year-old Theo Maledon. The history of teenagers contributing in the EuroCup is a bit more robust than one might assume. In total, 112 teenagers have logged more than 100 minutes in a EuroCup season and 16 have even managed to average over 10 points per game. What makes this pair interesting by EuroCup standards is their extreme youth. Doumbouya only turned 18 a month ago and Maledon will not turn 18 until June. Barely any 17-year olds have contributed at the EuroCup level. There are a few special cases, like Rubio, but what makes the play of Maledon, ALBA Berlin's Franz Wagner, and Doumbouya – before his recent injury – so unique is that only seven other players under the age of 18 have ever played over 100 minutes in a EuroCup season. Both Doumbouya and Wagner flashed a precocious ability to make opportunistic plays around the rim while the versatile Maledon has made major strides as a shooter, helping him average 11.5 points during the Top 16. In terms of efficiency, David Kramer warrants mention for his perimeter marksmanship. He ranks fourth among all players in spot-up efficiency this season, relishing the opportunities he has gotten to space the floor for ratiopharm Ulm. Tim Schneider has done much the same for ALBA Berlin, ranking 12th. Though some players have been more consistent than others in the confines of their respective roles, there's plenty of intriguing talent in this group, including players that have stood out in spurts, like Elijah Clarance, and those that seem to have turned a corner in their development, like Borisa Simanic. Regardless of which of these players wins the Rising Star Award, they have continued the EuroCup's proud tradition of nurturing some of the continent's top talent.